Our pediatric rehabilitation professionals help patients recover from surgery or injury, or manage a chronic disease. Comprehensive inpatient and outpatient therapies can improve your child's function and quality of life, restore independence, and promote physical healing. 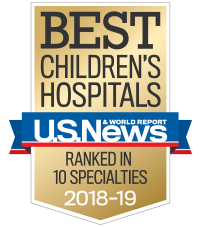 We offer pediatric rehabilitation services at two hospitals—Egleston and Scottish Rite—as well as several neighborhood locations throughout metro Atlanta. We treat children with impairments due to accidents, illnesses, injuries, congenital defects, syndromes and other conditions. Depending upon their needs and the recommendations of our rehabilitation specialists, children can begin rehabilitation at any of the four treatment phases: acute, inpatient, day rehab or outpatient. We also offer specialized services for teenagers, because they confront challenges involving maturity, physical changes, and intellectual and sexual awareness. Our specialized services help teens function as independent adults. Our Inpatient Rehabilitation Program addresses the needs of children and young adults after they’ve had a traumatic and life-changing injury or illness. Our doctors, nurses, therapists and other clinicians use their expertise to help patients build skills to function independently as they recover from brain dysfunctions and injuries, spinal cord injuries, cardiac complications or burns. We use everyday activities as the basis for therapy, which motivates our patients to work hard and allows them to regain as much independence and function as possible. Our Outpatient Rehabilitation Program offers nine neighborhood locations throughout metro Atlanta, providing audiology, physical therapy, occupational therapy and speech-language pathology services. Our team helps patients regain skills so they can be more successful at home and in the community. By training families in therapy techniques to use at home with their child, the Children’s outpatient rehab staff helps patients become more functional and independent. Our Sports Medicine Program is one of the few in the country dedicated exclusively to the care of young athletes. We offer sports medicine physical therapy at 14 neighborhood locations and provide athletic training coverage to over 40 schools and club sports in metro Atlanta. Our pediatric-trained team provides comprehensive assessment, treatment and expert advice for young athletes with injuries and conditions that affect sports performance. Day rehabilitation is a full-day therapy program for patients recovering from traumatic brain or spinal cord injuries, neurological diseases, debility or other conditions. It’s designed to help children and teens regain skills to perform everyday activities. Structured like a regular school day, the Day Rehabilitation Program is available from 9 a.m. to 3 p.m. weekdays. Our program also has a designated pet therapy dog, Stella. She helps motivate and encourage patients as they participate in therapy. To learn more about day rehabilitation at Children’s, call 404-785-3300. Physiatrists are doctors who specialize in treating nerve, muscle and bone injuries, and illnesses that affect function. They evaluate and diagnose patients and develop treatment plans that include therapeutic exercise, orthotics, prosthetics and adaptive devices. Physiatrists lead the child or teen’s pediatric rehabilitation team and treat the whole child, as well as the area causing the pain or limited function. Our program includes clinical and behind-the-wheel evaluations performed by a certified driver rehabilitation specialist. We measure and track how our patients are doing at admission, during inpatient and outpatient treatment, and when they return home. This allows us to evaluate our treatments and ensure that we’re consistently providing high-quality care. The results from recent years confirm that we’ve delivered superior rehabilitative care and assistance with recovery. We deliver superior rehabilitative care through admission, during treatment and after returning home. Children's has one of the nation's largest pediatric inpatient rehab facilities. Our program is accredited by the Commission on Accreditation of Rehabilitation Facilities (CARF). In 2016, our Day Rehab Program patients made more functional gains, on average, than patients at other national facilities. In 2016, the Children's Inpatient Rehab Program discharged 97% of patients compared to 91% of patients at similar facilities in the U.S. The Inpatient Rehab Program has received specialty recognition for our spinal cord system of care and our brain injury and pediatric specialty programs. We've had more than 88,000 patient visits to our outpatient rehabilitation facilities every year from 2010 to 2015. Our Adaptive Sports Program lets disabled kids compete, just like other young athletes. We offer comprehensive sports medicine services for elite, high school and middle school athletes. Make an outpatient rehab appointment.